This came hotly hyped and urgently recommended, and it did indeed sound perfect for me—a fantasy story about a wizard, in a world where magic is text and a sentence written in the language of magic can become a weapon, a tool, or a way to change someone’s mind. Cover quotes from Tad Williams, Robin Hobb, and Daniel Abraham (we’ll skate lightly over the one from Terry Brooks) testify to the kind of demographic this is pitched at. It’s a pity about the cover artwork, consisting as it does of the worst kind of hooded-white-bloke-with-boring-glowing-stuff tedium, but a look around the internet reassures me that the one I have is the worst of its many covers, and that most of them (in particular, the US cover by Todd Lockwood) are a great deal better. Annoyingly, Voyager haven’t given any indication on the cover that Spellwright is the first part of a trilogy. If you’re the kind of reader who wants everything wrapped up, then I’d suggest waiting for the others to come out—the next, Spellbound, is due in the autumn. On the other hand, the basic plot arc here is finished off neatly, though there are plenty of hooks for the next one, and I didn’t feel unsatisfied with it as a book in itself. The book’s central conceit is fascinating, and well explored. Nicodemus Weal is a wizard (a “spellwright”) who can’t spell right, and who may or may not be either the saviour of humanity (the Halcyon); the protector of the Druids, the Peregrine; or the Storm Petrel, the champion of chaos. Explaining how order & chaos link in with the languages of magic would constitute a spoiler, but it’s an interesting episode when it does, and I look forward to seeing the grand themes played out. Starhaven, the spellwrights’ university, is a distinctive setting with its pre-human buildings and a long arched bridge leading into a sheer cliff face. Like most other wizardly academies it’s an old, complex place, baroquely detailed and full of odd traditions. Normally, these schools are characterful enough in their own right to qualify as edifice fantasy, but I see a bit less of that here. Starhaven feels rather static—more of a backdrop than a participant. Unlike some of the more venerable literary universities—for example, Pratchett’s Unseen University, LeGuin’s Great House on Roke, and Barbara Hambly’s Citadel of Wizards—it’s hard to read Starhaven as contingent or mysterious, hard to imagine that a hallway might abruptly change its mind about its destination or debouch into a summer garden that was yesterday’s hand-numbingly cold lecture theatre. Most of the text is similarly functional & static; instead of metaphor or description, Charlton usually gives us narrative and statement. Partly, I suspect, that’s because of the sheer amount of setting & magic-system detail he wants to give us; I’m not convinced that all of it is necessary though, and I’d have preferred to have seen more left for the reader to deduce from context. On the other hand, it does fit with the mechanistic, structural nature of the magic, and it’s entirely appropriate for the book’s structure to echo the magic’s mechanics, given that the magic can quite literally (and literarily) rewrite reality. Overall, I was a bit disappointed with Spellwright, but I think that’s down to the amount of hype as much as anything. The plotting is solid and the high-concept magic system well realized; the only thing that didn’t lift it into the top-fantasy-author tier was the prose, and given that this is Charlton’s first novel I’m sure that will improve. That’s a rather facile way to put it—Nicodemus’s affliction is based on Charlton’s own experiences with dyslexia, which can be incredibly disabling when not recognized or allowed for. One consequence of that is that it’s better and more believably written than most magical afflictions. 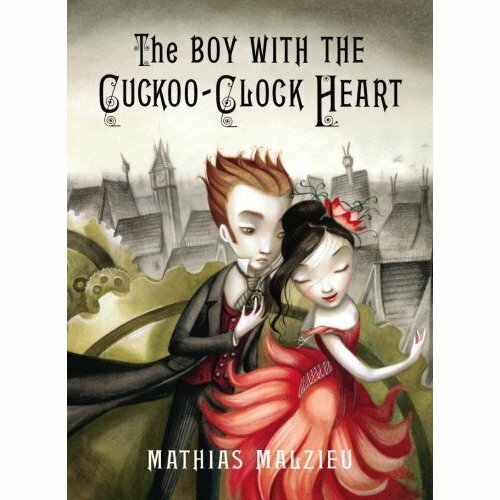 It’s a wrap-around dust jacket, with elegant, energetic artwork by Benjamin Lacombe. The two dancing figures are very stylised, done in glowing colours with doll-like skin and simply but cleverly textured clothing swept by motion. Their pose, and the whole energy of the picture, flows towards the right as if her beckoning hand were about to reach a little farther and lay the book open to us—though she has her eyes averted, and he looks alert and a little suspicious. Behind them, brass gears turn, part of some gigantic clock with its workings laid bare and the hands an afterthought, with (on the back of the book) two dark and villainous silhouettes running across the cogs. The colours are warm but muted and patchy, as though stained with soot, and behind them a tall, crowded city rises. Done in smudged and softened pencils, the steep tiled roofs and chimneys are all a little crooked, and a few shadows (perhaps birds, or planes; perhaps dragons, or ornithopters) fly in the hazy air. The sky is clear and parchment-pale, a frame for the title, and the four corners are all subtly shadowed giving a sense of enclosure and an enhanced book-ness. The layered dimensionality of it suggests depth and complexity, while the swept and stylised nature reminds us that this is a text to be read rather than a secondary world to be vicariously experienced. I only have one criticism, and that’s the style & placement of the author’s name. The font is rather more generic than I’d prefer, but the white text hides against the red skirt, an effect made worse by the tangential swirls. The metadata format (title horizontally at the top, author’s name at the bottom in smaller text, both centred) is so pervasive that it would only be interesting if it were something else. The contrast with most recent fantasy releases is rather sad. The artists who do covers for most fantasy books (most from larger UK publishers, at any rate) are very accomplished, but have an absurdly small artistic vocabulary. There will be at least one figure, either full-length or a headshot; cloaks, cleavage, and swords are common, as are straps, buckles, and stubble. Perhaps there will be a horse, or swirly magic instead of a sword. There will often be a monster; if so, it will have spikes or trailing bits. The landscape will be dramatic and gloomy, and probably on fire. The “generically mediaeval” school of fantasy architecture is going out of style, but gothic spires, dark alleyways, and pseudo-Mediterranean terraced vistas are still popular. The painting will have been done almost photorealistically in oils or acrylics, or with digital-native techniques; the desired effect seems to be disintermediation, removing as many traces as possible of technique or painterly vision from between the prospective reader (for these are always aimed at the person who has not yet bought the book, rather than at the collector or the admirer of beauty) and their potential tour of its secondary world. The scene will inevitably stretch to the edges of the cover, without frame or background panels, and it will be oriented either into the centre of the cover or towards the viewer. There will be very little on the spine, and nothing (a plain black background, or a simple empty land- or skyscape) on the back cover so that the wordy blurb and the pull quotes from other authors stand out. In addition, everyone is young, white, slim, able-bodied, and beautiful. If there are any older people, they will be male and probably Wisely Bearded. They may or may not bear any actual resemblance to the characters inside the book, but will certainly be the artist’s literal interpretation, and a faithful attempt at rendering people who could actually exist—and who could, plausibly, be the reader, or at least their idealized versions of themselves. The reason so many have hoods shadowing their faces is the same reason so many romance/erotica books have headless women in corsets, or disembodied legs; nobody wants to know, for certain, that it’s Not Them. I’ve reviewed this one over at The Future Fire. It’s epic fantasy from new imprint Rhemalda Publishing, and quite frankly it’s dreadful; the only thing worse than the writing style is the cover art. I have accordingly reviewed it at length. This one is a triumph of marketing, for 1979ish values of “triumph”, and for the kind of marketing that doesn’t involve very much honesty about the book’s contents. In fact, it hits a double word score on the ism front – it’s racist and sexist. The blurb starts, Ramagar was a thief, and carries on talking about him, mentioning in passing his clever mistress Mariana, the beautiful dancing girl. The front cover shows a very Nordic guy in a short tunic, with a small scimitar; this is not Ramagar. The book has (of course) a map in the front, and the map is a slightly distorted version of Europe with all the names (except Brittany) completely changed. There’s an Aran, but it’s both much larger than either Aran or Arran, and in entirely the wrong place. Ramagar, on the other hand, comes from a city which roughly corresponds to a heavily exoticised Marrakech. It isn’t a case of whitewashing, but what they’ve done is almost as bad; they’ve put a more minor member of the adventuring party on the front, rather than the headline guy they talk about on the back, because the headline guy has brown skin. I’ve started reading David Anthony Durham’s Acacia Part 1: The War with the Mein. Will probably finish it today, but I wanted to post some preliminary thoughts first. Let me get one thing out of the way first – it’s pretty good. 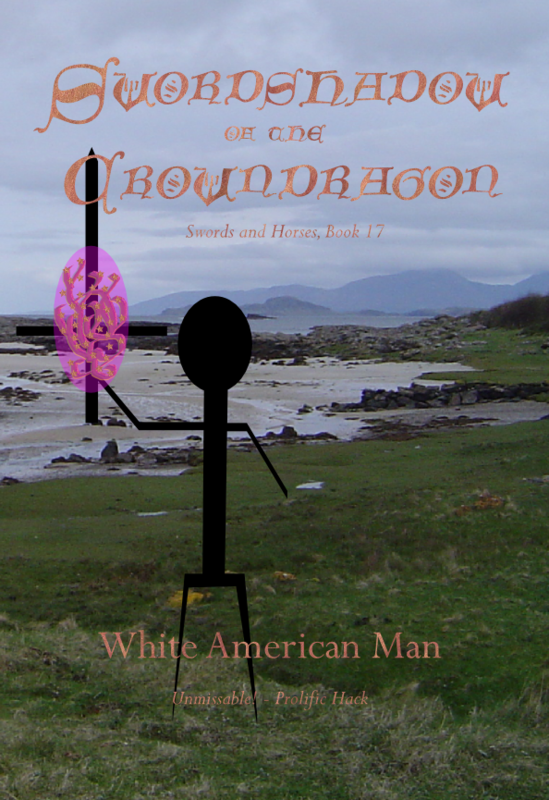 I’d recommend it to all fans of secondary world fantasy series about kings and wars. Which sounds lukewarm, but then they’re generally not my cup of tea overall. I probably wouldn’t have bothered reading this if it hadn’t been for the post-RaceFail emphasis on recommending BME SF & fantasy authors, but that would’ve been my loss, really. It’s good on the race issues, with actual diversity, sensibly placed skin colours, an explicit statement that they’re all the same people (none of this mucking around with pointy ears or green skin), and both some racial tensions and some resolutions to them. Of course, the cover’s still got a vaguely Celtic white chick in a red dress on it (along with a bunch of LARPers) but you can’t have everything. It’s got a map in the front, which would be a strike against it if it didn’t already have a title including “Part 1″, the word “War”, and the name of a fantasy race, which renders the map somewhat redundant as a signifier. And yes, we will be visiting everything on it. The character names are a bit odd in places – King Leodan Akaran, for instance. Which would be fine, if his Chancellor (“born within a few months, and from a family nearly as royal”) wasn’t named Thaddeus Clegg. Right from the get-go, it’s like being beaten about the head with the infodump stick. We keep getting pages of stuff about history or character background, then someone notices they’ve drifted off into reverie. It’s like he’s heard of “show, don’t tell” and decided that meant “tell them then tell them it’s what a viewpoint character is thinking”. Omniscient narrator is pretending to be invisible. The narration is – I won’t say dull and lifeless, because it’s not in the slightest, but it’s rather distant, as though he’s putting a glass pane between us and everything. That’s not helped by the way he keeps introducing us to interesting people, building them up for a large role, then zooming out and telling us how they died. I suspect he’s still finding his pace as a writer, working out what to show us & how, but he’s got a lot of good stuff going for him – there are some unforgettable images in there, and he cares about material culture (what people wear, how they live, how they build) which is always a plus for me. The plot follows the classic “does what it says on the back of the book, then some more stuff” arc – rebels attack Empire, Empire falls, heirs go into hiding, the counter-rebellion starts up. Nothing the slightest bit unexpected, but he carries it off.